Our hospital provides vital services to Banbury's growing population. 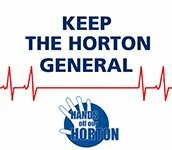 Consultant-led Maternity, SCBU, 24/7 Children's Ward, A&E, orthopaedics and Critical Care Unit under threat. Can you help us raise funds to fight the threats? Thank you if you are condsidering this! Donating direct means we benefit from your whole donation. 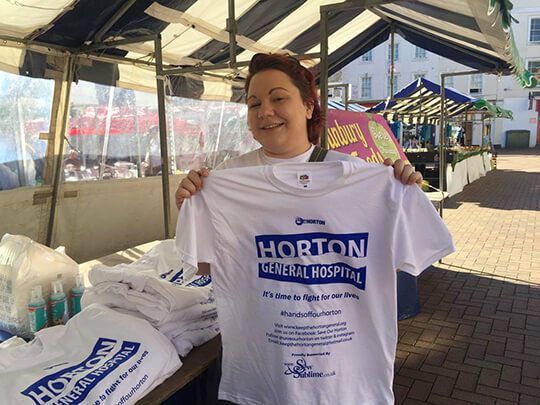 Please email us at keepthehortongeneral@hotmail.co.uk to let us know if you are making a donation so we can keep our records straight and say thank you! Available in sizes medium to XL - perfect for wearing over your jumper in colder weather! We're also selling badges and car-stickers for a donation, wherever we have a stall. Wear it on your coat / stick it on your window so people who STILL don't know about the threats can find out. 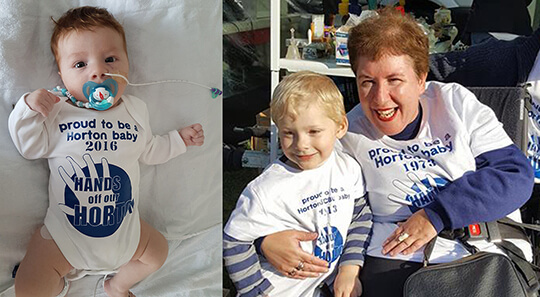 Contact supporter Jane Humphries-Jones via facebook to buy Horton-themed baby suits, shopping bags, bibs and "I'm a Horton Baby" t-shirts (which can be personalised for the year in which you were born!) At least £1 from each item sold is donated to KTHG funds.